1. Do the recent history and current state of New Zealand manufacturing give grounds for concern? 2. If so, do the difficulties experienced by manufacturing matter to the wider economy? 3. If so, can anything be done about it? I suggest that the answer to each of these questions is in the affirmative. Is New Zealand Manufacturing in Crisis? 1. There can be no doubt that New Zealand manufacturing is facing a crisis. This is partly a reflection of the recession induced by the global financial crisis and of the failure to achieve anything other than a faltering and partial “recovery” since then, and partly an intensification of a longer-term comparative decline. 2. The statistical evidence for this is compelling. Manufacturing output has fallen sharply from 2007 levels and – unlike other sectors in the productive economy – has yet to return to those levels. The most recent figures show that little improvement can be expected; in the immediate future, further decline is at least as likely as a recovery in manufacturing output. 3. Pessimism about the output figures is strongly supported by the statistics for manufactured exports and imports, for investment levels in manufacturing and – most worryingly – for employment in manufacturing. The trade figures show that imports of manufactured goods continue to grow faster than exports and that, as a consequence, the trade gap in manufactured goods continues to widen; that gap will only widen further as consumption recovers and reaches new levels. 4. Investment in manufacturing, and particularly spending on research, are at low levels and reflect a continuing low level of confidence in the sector. These factors all show that the basis for any recovery in manufacturing continues to weaken and to be further eroded. 5. Perhaps the starkest and most significant piece of statistical evidence is the loss of jobs in manufacturing. While attention is often directed to other statistical series, such as the Household Labour Force Survey, there is no doubt that there has been a substantial loss of actual jobs in manufacturing over recent years. According to NZ Statistics, the loss of manufacturing jobs in the four years since 2008 has totalled around 40,000 – a hugely worrying rate of attrition. Recent announcements by major manufacturers of job losses in a range of important industries suggest strongly that the loss is set to continue and to intensify. 6. Paradoxically, the one small scrap of supposed better news in the past month – a slight rise in manufacturing productivity – is merely further evidence of the rapidity of decline. As weaker parts of manufacturing are forced to lay off workers or close down altogether, the short-term statistical effect is to boost productivity for the remaining workforce, at least for a short time. To welcome this is rather like congratulating a cricket team on an improved batting average, achieved by shooting the tail-end batsmen. 7. The most worrying aspect of these most recent tribulations is that they are further evidence of a long-term decline. Manufacturing as an element in our productive economy has been declining in importance for three decades. In 1972, manufacturing accounted for 26% of GDP; by 2009, that figure had dropped to just 12% and it will almost certainly have declined further since then. 8. Many developed economies have experienced a comparative decline in manufacturing, though few have seen a decline as sharp as New Zealand’s. Policy-makers elsewhere, like ours, have pinned their hopes on developing other parts of their economies in the attempt to make up for the loss in output that has been the consequence of manufacturing’s decline. 9. They have all discovered that the loss of manufacturing capacity cannot be made up for by other activities. Perhaps the most striking of these instances has been the British development of a world-leading financial services industry to help offset the decline of British manufacturing. They discovered, with the global financial crisis, that much of the supposed wealth-creation from financial services was an illusion and that, even at its peak, it delivered benefits to only a very small part of the population. 10. In New Zealand, so far as we have a policy at all, we seem to be pinning our hopes for an improved economic performance on areas like mining and exploiting hoped-for oil and gas reserves, and on making films which will help to stimulate tourism. Our own experience and that of other countries strongly suggest that these developments are very unlikely to match the value of the output and employment we have lost as a consequence of manufacturing’s tribulations. In countries like the United Kingdom and the Netherlands, the advent of North Sea oil did little to offset the loss of manufacturing capacity, and even in Australia, the mining boom has demonstrated the downsides of a two-speed economy. 11. The most successful economies of the last decade or two have followed a quite different path and – like Japan, Singapore and Korea before them – have understood that there is no substitute for the great advantages that success as a manufacturing economy uniquely delivers. China, India, Brazil and other rapidly developing economies have focused on building strong and competitive manufacturing industries which enable them to exploit huge world-wide markets for efficiently manufactured products. As these economies demonstrate, the ability to compete successfully in the internationally traded goods sector is the single most important determinant of economic growth. 12. In almost all developed economies, a strong manufacturing sector is the principal engine of growth and economic development. International statistics show that it provides the greatest scope for rapid productivity improvements and for employment growth in the form of relatively well-paid and secure jobs. A successful manufacturing sector will stimulate innovation, research, technological advance, and skill training across the whole economy. A high level of good-quality and well-paid manufacturing jobs will lift purchasing power; the corollary is that the loss of manufacturing jobs will have a deflationary impact on other sectors. An economy that cannot compete in international markets for manufactures must resign itself to high levels of unemployment and to declining living standards in comparative and possibly absolute terms. 13. The importance of manufacturing to the whole economy is such that we cannot afford – as we are doing at present – to deny or dismiss its current weakness. We need to analyse the reasons for that weakness and to make policy decisions that will address them. It is not good enough to let things slide. Policy mistakes need to be corrected and a strategy developed for re-building our manufacturing capacity in the interests not only of manufacturers themselves but of the economy as a whole. 14. Manufacturing is declining and manufacturing jobs are being lost because New Zealand cannot compete with more efficient manufacturing economies in international markets, including our own. This is partly for reasons, such as our small size and remoteness from markets, that are said to be beyond our control. It is easy to overstate the importance of these factors, however; other small economies, such as the Scandinavian countries, manage better than we do, and – if we had been able to wave a magic wand to offset the problems of remoteness – we could not have done better than invent the internet. 15. The main reason that manufacturing is declining is that our costs of production are too high to allow us to compete successfully. Despite their publicly stated aim of “closing the gap with Australia”, the government’s response to this issue is to try to drive down wages and therefore labour costs through a variety of measures in the vain hope that this will improve our competitiveness. It is no accident that our Minister of Finance touts New Zealand’s low wages to Australians as a competitive advantage to doing business here. 16. That is why benefits are cut and entitlement to them is made more difficult, labour laws are changed to reduce protections for workers, the real value of the minimum wage is held down, employers who fail to pay the minimum wage are allowed to get away with it, young workers can be taken on at less than the minimum wage, and tacit support is given to major employers who want to break unions and hold wages down. The intention is that these measures will force the unemployed back into the jobs market, not to take jobs that are currently unfilled, but to displace and compete with the low-paid for the reducing number of jobs that they currently hold. This, it is hoped, will drive down wages at the bottom end of the scale, and so exercise a downward pressure on the whole of the wages structure in this country. 17. Not only is this strategy socially destructive, in the sense that wages, as distinct from profits, top salaries and property values, would bear the whole brunt of adjustment; but even if it could be driven through with sufficient ruthlessness and for long enough to have a real economic impact, it would be economically disastrous. Lower wages across the board would have a damaging deflationary impact and drag the economy lower, making it smaller and weaker and leaving as the only remedy to the competitiveness problem an ever more savage attempt to drive wages down. The government’s fixation with this slow-motion race to the bottom, however, seems to preclude it from any understanding of the urgency of our situation. 18. The paradox is that current policy (indeed, policy as applied for the last three decades) has not only failed to address the real problems in any effective way but has actually and deliberately made them worse. The obvious and well-tried remedy for an economy that finds itself to be uncompetitive is to devalue the currency. A lower dollar in our case would immediately, comprehensively and fairly (because it would affect everyone) improve our competitiveness and would provide a secure base from which we could begin to sell more, earn better margins on our sales, re-invest in improved capacity, employ greater numbers and generate a higher level of economic activity. 19. 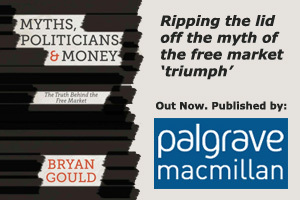 Policy-makers in western countries have for a long time steadfastly refused to take this obvious step, advancing manifestly false arguments that devaluation will inevitably cause inflation which will quickly erode the competitive advantage – arguments that are conclusively debunked in a comprehensive study to be published in the New Year by Palgrave Macmillan and written by John Mills, a former co-author of mine. Politicians are of course always reluctant to give up the short-term advantages produced by over-valuation – the cheap holidays and imports – and hope that voters won’t notice the long-term and debilitating effects on living standards and purchasing power. 20. It is noteworthy, however, that many western countries have now abandoned this traditional stance in the aftermath of the global financial crisis and have engineered – through measures like quantitative easing and with varying degrees of subterfuge – substantial devaluations. New Zealand, however, not only blithely ignores these competitive devaluations and their impact on our own competitiveness, but proceeds undeterred with policies that directly and remorselessly drive up the value of our currency so that our competitiveness is further reduced. A government that makes every effort to drive wages down is remarkably unconcerned, it seems, that its own policies drive up not only labour costs but all domestic costs, and thereby price us out of internationally traded markets. In this way, our policy-makers compound our natural disadvantages of remoteness and small size, and ensure that our manufacturing base continues to be eroded. 21. A manufacturing economy that has to struggle into the headwind of an over-valued currency finds that all of its costs are translated into international prices that are too high to be competitive. There is then a choice for manufacturers who want to sell into export markets or who want to resist competition from cheap imports at home; they must either maintain their prices so that the costs of production are covered and a reasonable return on investment is produced, with the result that they lose market share and are eventually forced to abandon the market to competitors; or they must cut their prices so as to remain competitive, with the result that they do not generate a good enough return to make it possible to re-invest in the new technology and equipment, skill training for the workforce, new product development, after-sales service, advertising, and so on, so as to keep up with competitors who are constantly raising their game. On any of these scenarios, the inevitable outcome of an overvalued currency is a weaker and smaller manufacturing sector, as enterprises try to cut costs by laying off staff, reducing capacity, moving overseas or selling to foreign owners, and in the end closing down altogether. 22. We are constantly told, however, that nothing can be done about the overvalued dollar. This is completely wrong. While flows of “hot money” across the foreign exchanges are so massive that they would immediately swamp any attempt by the Reserve Bank to rig the market, the real reasons for overvaluation lie in the perception that we will continue to offer an interest rate premium to short-term foreign speculators who will also then expect a capital gain as well. It is this constant inflow of “hot money” seeking a quick return that explains an exchange rate that is not remotely justified by our economic performance or by our balance of trade. If we stopped pursuing such an irrational policy, the exchange rate would fall significantly. 23. We are committed to this irrationality because we insist that the only goal of macro-economic policy is the control of inflation, and that controlling inflation requires interest rates to be raised at the slightest sign that prices might rise – a sure recipe for keeping the value of the dollar – and unemployment – high. We could end this damaging policy stance by re-focusing and correcting the mistakes which cause the problem. 24. As other countries have demonstrated, there are other steps, too, that we could take that would reduce the demand for our dollar – a currency that, incidentally, is one of the most traded in the world and is traded in volumes out of all proportion to the size of our economy and volume of trade. A more relaxed fiscal and monetary stance would not only stimulate activity and demand in the domestic economy but would also (say it softly) reduce the “confidence” of foreign investors – that same “confidence” that leads them to take a one-way punt on our dollar. 25. The alternatives to the current policy mistakes are not hard to find. We should, following the example of successful economies like Singapore, focus on full employment and competitiveness as the central goals of policy and indicators of success. We should address the real causes of inflation – the huge increase in bank lending for non-productive purposes – by regulating the scale and purposes of bank lending, thereby allowing interest rates and exchange rates to find their natural market-clearing levels. We should allow the resultant lower exchange rate to stimulate growth, employment, profitability, investment and productivity, and to encourage saving and exports rather than consumption and imports. 26. We should stop kidding ourselves that we are such an economic powerhouse that we can cheerfully face up to “free trade” deals with some of the most powerful and efficient economies in the world; “free trade” in such cases usually means simply absorption into those larger economies. We should recognise that we are no longer by international standards a “developed” economy but are much more akin to a “developing” economy – the kind of economy that has usually found it advisable to ensure that domestic industries are not entirely wiped out by powerful competition from overseas. Today’s new economic giants have all travelled this kind of path in order to reach their current dominance. 27. Sadly, ideological prejudice has convinced our policy-makers over three decades that commonsense policies are somehow dangerous and irresponsible, and no amount of evidence that the real danger – the danger of long-term decline – comes from the current orthodoxies will induce them to change their minds. By the time, they are finally compelled to do so, we will have no manufacturing industry left and will largely have lost the power to do much about it. Charles de Gaulle was a pain in the neck. As the self-appointed leader of a defeated and occupied country, he had very few cards to play. But he nevertheless succeeded, through making a nuisance of himself, in making sure that the other Allied leaders – Churchill, Roosevelt and Stalin – had to take France’s interests into account. It was his stubbornness that set the scene for France’s post-war reconstruction, and put France in the pivotal role in setting up what has become the European Union. He did it by convincing others that France was not going to be pushed around. De Gaulle showed that it isn’t the cards in your hand but the way you play them that counts. New Zealand could learn a lesson or two from the French leader. As a small country, we are in constant danger of allowing ourselves to be pushed around, like a cork bobbing on the global economic ocean, the helpless victim of every tide or current that comes our way. Unlike de Gaulle, however, we seem to accept, even welcome, that there is nothing we can do in the face of superior power. Sadly, we have no chance of defending our own interests if we signal in advance to all comers that we are so conscious of our weakness that we will do whatever is required of us. Yet, that seems to be the negotiating posture of our leaders. We have seen enough instances of our government rolling over when told to do so to know that it is a deliberate strategy. We will, it seems, do anything if it means making a buck. Some recent examples make the point. So keen were we to persuade Warner Brothers to make films here that we readily changed our labour laws (those laws that protect the rights of our workers) in order to accommodate the insistence of a powerful overseas employer that they must have the right to hire and fire at will. We were unconcerned about the rights of New Zealand workers, or the self-respect of a supposedly self-governing country. The proposed deal with Sky City is another case in point. Another overseas company quickly twigged that, if they want more relaxed gaming laws as well as getting the inside running on what – with favourable tax treatment – looks like being a very profitable investment, it is only a matter of finding the right price. Our wheeler-dealer Prime Minister could be relied on to do the rest. Concerns about the increase in problem gambling, or the propriety of a behind-the-scenes deal, are – we are assured by one of Auckland’s business leaders – a “distraction”; and we know, don’t we, that nothing must be allowed to distract from chasing the dollar? These may seem relatively minor matters, but there are other more serious issues ahead. Who could doubt (as is now confirmed by the government itself) that the overwhelming issue in the Crafar farms saga was the fear of displeasing the Chinese government? The message is clear; we are so concerned about retaining Chinese goodwill that we will do whatever is asked of us. The Chinese will have marked, learnt, and inwardly digested this simple truth. The irony is that, in China, business is an arm of government and does what government tells it, whereas here, and increasingly, government is an arm of business. The main reason for concern about the Chinese purchase is that it is not a normal commercial trade arrangement, but is the probably irreversible acquisition of long-term productive capacity in pursuit of a deliberate (and perfectly legitimate) Chinese government strategy to buy control of such capacity in a whole range of different economic areas worldwide. That strategy will have been much encouraged by our government ‘s welcome for further “investment” of this kind – something we know from their keenness to sell yet more of our assets in return for similar “investment”. Overseas investment that develops new productive capacity is of course to be welcomed; but the purchase of existing assets, on the other hand, so that the ownership, control and profits from those assets move overseas, is quite a different matter. We are already world leaders in this latter category, having sold a higher proportion of our economy to overseas owners than any other developed country. All of this means that the omens are not good for the trade negotiations now under way with the Americans and others. The Americans are insisting, as the price of a free trade deal, on changes to a number of our laws, including reducing the role of Pharmac; and we are also being pressed to accept the right of American corporations to sue our government in specially constituted tribunals if – either now or in the future – laws to protect New Zealand interests, on an issue like the plain packaging of cigarettes, can be argued to be contrary to American commercial interests. Given our government’s clearly signalled willingness to yield to pressure, what confidence can we have of anything different from what is now the usual pattern – some tough talk, a period of obfuscation, and then a discreet cave-in? Oh for a Charles de Gaulle! Europe’s leaders are being taught lessons that they refuse to learn. The Greek economy was always too weak to join the euro zone; now that it is – as a consequence – flat on its back and weighed down by debt, the “remedy” imposed on them by their European partners is an enforced dose of yet more austerity that will make it quite impossible for them ever to pay off their increased debts. The consequences for the European – and ultimately the world – economy will be dire. Greece is only the beginning; a recession-infected Europe now looks inevitable. Already, even in remote New Zealand, we are being warned that the euro zone’s difficulties will mean a worse economic outlook for us in future years. But before we put the entire blame for our woes on the Europeans, let us recognise that the bizarre European determination to treat austerity as the remedy for recession is shared by our own leaders. We seem to be locked into the same ideological deep-freeze. We are, after all, now entering our fifth year of either negative or minimal growth. We, too, have insisted that the key to securing a recovery that seems constantly to disappear further over the horizon is to close part of our economy down. Our principal goal, it seems, is not to reduce unemployment and get the economy moving, but to cut the level of government economic activity. The result? The economy continues to stultify and the government deficit proves increasingly stubborn and difficult to manage. But our economic problems are not defined by the recession alone; they are more deep-seated than that. The simple truth is that, despite the great advantages of buoyant export markets and record commodity prices, we continue to live well beyond our means. We make up the gap between what we earn and what we spend by borrowing from overseas and by selling off our assets to foreign owners. We have been doing this for decades, but the price we pay for this indulgence is getting increasingly steep. We have to pay an interest rate premium to foreign lenders, if they are to continue to lend to us, and we also have to pay to foreign owners – across the exchanges – the profits on the assets we no longer own, with the result that our perennial trade imbalance gets even harder to manage. More and more of our national wealth goes overseas. We have less and less control over our own economy, as the proportion we actually own diminishes. High interest rates not only inhibit domestic investment but produce an overvalued dollar that prices our goods out of international markets, including our own, and reduces our return on those goods that we do sell. We have been travelling down this no-exit road now for nearly thirty years. Yet our policy-makers still set their faces against any change of policy. We continue to assert that the only focus of macro-economic policy must be to control inflation, even though the measures we use to do so are poorly focused and slow-acting, and actually make our real problem much worse. What is our real problem? It is certainly not inflation. It is that we are basically uncompetitive. We have steadfastly ignored the fact that the world has changed and that rapidly developing economies like China, India, Korea, Taiwan and Singapore are now super-competitive economic powers, determined to build on that huge advantage by holding down their exchange rates and becoming ever more competitive. They have rapidly built the strength of their productive sectors and have earned huge trade surpluses which have allowed them to buy up the assets (including our own) that they will need for further development. Many of them already enjoy living standards better than ours and pay wages and salaries that are higher. We, on the other hand, are arrogant (and stupid) enough to believe that competitiveness does not matter, and that we can – in defiance of economic rationality – continue to push up our exchange rate with impunity. By focusing on inflation, to the exclusion of other objectives, and using interest rates and an overvalued dollar in the attempt to control it, we make it inevitable that our lack of competitiveness gets worse. The result is that we dare not grow – even in a recession – for fear of balance of trade constraints, and are reduced – for as long as we can find willing lenders and buyers – to financing our unsustainable consumption by overseas borrowing and selling off what little remains of our assets. It is time that we realised that competitiveness produces improved productivity, and not the other way round. We cannot hope to innovate and develop if we are constantly fighting the headwind of being uncompetitive. We should no longer be tinkering at the margins, with largely ineffectual tax changes and constant but ineffectual exhortations to improve productivity; it is time to make a step change by making competitiveness the focus of policy. But our leaders seem blithely unaware that their out-dated nostrums are destroying our economic future. The exchange rate, and issues of competitiveness, it seems, are no-go areas for discussion. They prefer their own simple certainties to the evidence before our eyes. When I left New Zealand for the first time in 1962 to study at Oxford University, I took with me an LP (yes, real vinyl!) of the St Joseph’s Maori Girls Choir. I was amazed to discover over my years in Britain that the one thing guaranteed to make me homesick was playing that record. Wiki Baker’s beautiful voice was only part of the explanation. I realised that the sound of Maori music awoke in me unsuspected emotions – as though I had throughout my early life picked up from the ether as part of my own heritage a cultural sensitivity to which my emotional antennae, even 12,000 miles from home, were still attuned. This was all the more surprising to me, since – while I had always got on well with my Maori classmates, and recalled with pleasure the rivalry I had enjoyed with Johnny Tapiata when we contested the Oratory Prize at Tauranga College – it had never occurred to me that Maori language and culture were still alive and (comparatively) well. When I returned to live in New Zealand in 1994, however, I discovered a country very different from the one I had left three decades earlier. There was a widespread recognition that New Zealand was – in its foundations – a bicultural society and that Maori had an equal part to contribute to that audacious enterprise. And I had the pleasure at Waikato University of working with Robert Mahuta in the committed work he was doing to bring about a raupatu settlement for Tainui. One element of that settlement was that Tainui became the owners of the University’s campus. There were those who found this prospect disturbing – and it is true that a few days after the settlement was signed, an enthusiastic young man arrived in my office and demanded a guided tour of the estate of which he was now part-owner! But Tainui proved to be ideal landlords. They saw the relationship with the University as a partnership, and substantial parts of the rent we paid each year found their way back to the University in the form of scholarships and other help for disadvantaged students. The University derived a further benefit; we became one of the few tertiary institutions in the country to have a proper legal title (in the form of a perpetually renewable lease) to our own campus. Tainui, of course, has gone on to become an economic powerhouse in the Waikato and beyond. How, then, should pakeha regard this Maori resurgence? Is it a threat to be nipped in the bud (assuming that to be possible) or is it an opportunity to be seized for the benefit of us all? Let us first be clear about one thing. Maori and pakeha should have no difficulty in treating each other with mutual respect. Our joint presence in this beautiful land is the outcome of two of the bravest odysseys in human history; first, the great Polynesian navigation of the vast Pacific, and secondly, the voyage undertaken by my forbears, when families from small rural communities who had never seen the sea in their lives before boarded tiny sailing ships on a three-month journey to an unknown destination, the most distant point on earth. I am proud of that achievement, as my Maori compatriots are of theirs. The difference was that the Maori journey took place much earlier, so that knowledge of the huge changes that had taken place in the rest of the world over a thousand years was denied to them. Pakeha have little understanding of the huge adaptation that has been required of Maori over the last relatively short 180 years or so. It is greatly to the credit of both of us that we are committed to creating out of these historical givens something new and wonderful. If we succeed, we will have achieved something never before attempted – the synthesis of two very different cultures as the foundation stone of a tolerant and inclusive society where difference is seen as a source of strength rather than conflict. But we are still far from that achievement. We cannot call it success when Maori – by virtue in most cases of just being Maori – have a less than a fair share of our effort at partnership. We pakeha cannot be happy when a significant element in our country has worse health, poorer education and job prospects, and less chance of self-fulfilment than the rest. If we want to build a strong and successful country, who do we prefer as partners – a perpetually aggrieved, underprivileged, racially defined underclass or proud and successful brothers-in-arms, confident in their own heritage and identity? There are those, of course, who say that it’s for Maori to get themselves to the starting-line, that they must take their chances like everyone else in a market-based economy which rewards the strong and leaves the rest to fend for themselves. But we can do better than that. Yes, of course, there will be extremists on both sides of the issue who claim more than is justified. But the best defence against extremism is to recognise the justice of moderate claims. This is not the time to be fearful and mean-spirited. A divided society is a weaker society. We should grab the chance to understand and value each other, to support each other, and to build together. This article was published in the NZ Herald on 12 July.